comes back after settling down. Surgery for de Quervain's tenosynovitis is not usually available through the public health system. However, it may be available in severe or disabling cases. You may choose to pay to see a private plastic surgeon or private orthopaedic surgeon to find out if surgery will help you. Ask your GP to refer you. Surgery for de Quervain's tenosynovitis aims to relieve the pressure on the tendons at the base of your thumb. The surgeon makes a small cut through the skin over the tendons, then cuts through the band that holds them down. This gives the tendons more room to move. The surgeon then stitches and bandages the wound. This operation is usually done under a local anaesthetic, which means you don't go to sleep but the area being operated on is numbed. This is very safe and effective, and also has fewer risks than a general anaesthetic (when you go to sleep). Your surgeon will talk to you about this. You can eat and drink before and straight after the operation, and during the operation you'll be able to ask questions about what is happening. Most people go home on the same day as their surgery and don't need to stay in hospital overnight. What can I expect from surgery for de Quervain's tenosynovitis? This surgery is usually very successful. The pain usually gets better soon after surgery, and seldom comes back. What are the risks and complications of the surgery? All operations carry some risk, and it's important to talk about this with your surgeon before you decide if you want surgery. Tell them about any problems you have had with operations or healing, including any reactions you've had to medicines. The risks below are not the only risks but are the most common ones, or the most serious. You may have some pain around your scar for three to six months, but it's usually mild and goes away. However, it might be a problem when you're doing heavy physical work. This may affect how long it takes you to get back to work, as well as some of your everyday activities. There is a risk the nerves that supply your thumb and back of the hand could be damaged. This often happens as a result of the nerves being moved around during the operation and is likely to get better. Very occasionally this damage is permanent and results in long-term hand numbness or weakness. Occasionally, people get a lot of swelling or hand stiffness, and need long-term hand therapy to recover. And rarely a condition called complex regional pain syndrome (also called reflex sympathetic dystrophy) can develop after hand surgery. This can cause pain and swelling in your hand, which usually lasts up to a few months but may be permanent. This is treated with good pain relief and physiotherapy. Sometimes the surgeon may miss one of the trapped tendons, and so you will continue to have pain afterwards. If this happens you may need another operation to release the tendon. 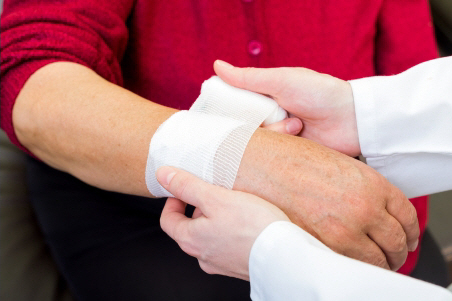 After surgery your wound may become infected, and you may need antibiotics, but this isn't common. You may bleed a lot, and you may develop a haematoma (collection of blood) that needs draining. Your wound may take a long time to heal. You may get what are called hypertrophic scars. These are tender, woody and thicker than normal scars. Tell your surgeon if you have had these in the past. You may have an allergy or reaction to the anaesthetic, which rarely, can be life-threatening. Written by HealthInfo clinical advisers. Endorsed by Plastic Surgery Department, Canterbury DHB. Page created January 2017.